Finding myself with both free time, as well as the health to take advantage of it last Saturday, I decided to have a tourist day in Ayacucho. 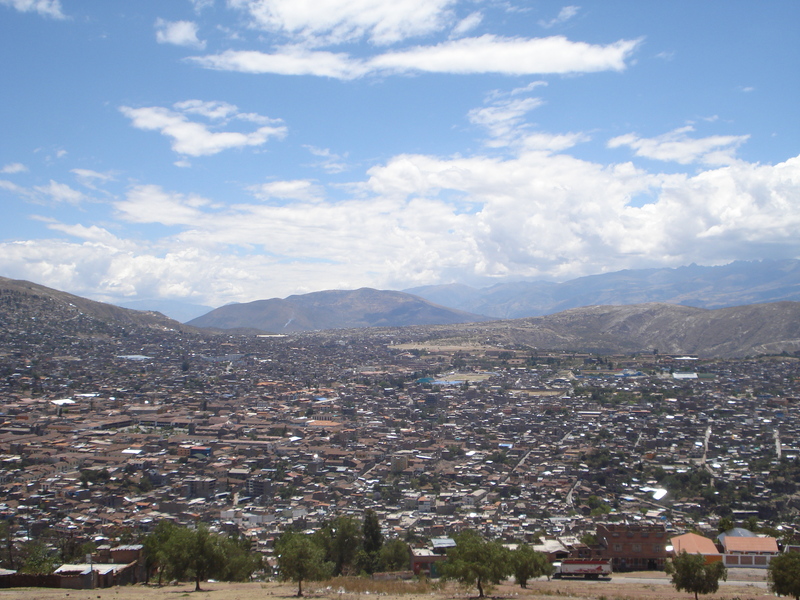 I stopped at the Mirador del Carmen Alto (just around the block from my house), a fantastic view of Ayacucho from the top of Carmen Alto, one of the higher districts. Later, I ventured downtown and found that on Saturdays, the midday siesta lasts until at least 3:30. I wondered around and took photos of the churches and other sites (many of which I lost due to a glitch loading them onto my computer, trust me, I’m kicking myself hard), but felt fairly pictured out after about half an hour. So I grabbed a map from a local hotel and started heading north. Cathedral doors and statues of Saints Peter and Paul. I passed by several more gorgeous cathedrals and then came upon the Shosaku Nogase Mercado Artesanal. Given during Fujimori’s presidency, this market includes two buildings full of vendor shops, which you might find in most tourist locations around Latin America. Instead of artisanal works, I found largely factory made tourist fodder, though it was fairly unique to Ayacucho. I shouldn’t complain, this was the first place in Ayacucho I found with post cards. Looking at the map, I realized I was not too far from the Museo de la memoría, founded by the Asociación Nacional de Familiares de Secuestrados, Detenidos y Desaparecidos del Perú (ANFASEP). ANFASEP was founded in 1983 to call attention to the disappearances and provide safe resources for those in need during the years of violence. 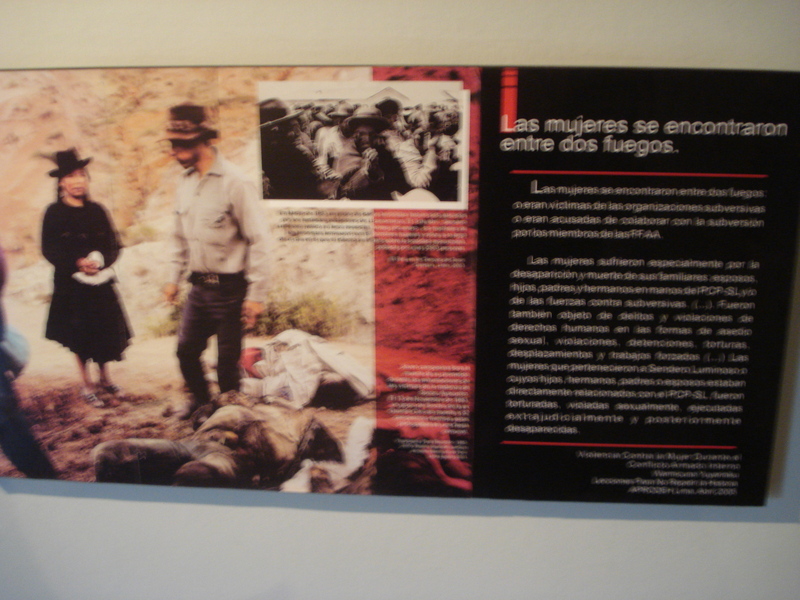 With the help of the German Embassy, they opened the museum in 2005 “para que no se repita” (so that it is not repeated). Names of the disappeared or dead. It’s a powerful museum. The outside walls are painted with a mural of various human rights abuses. 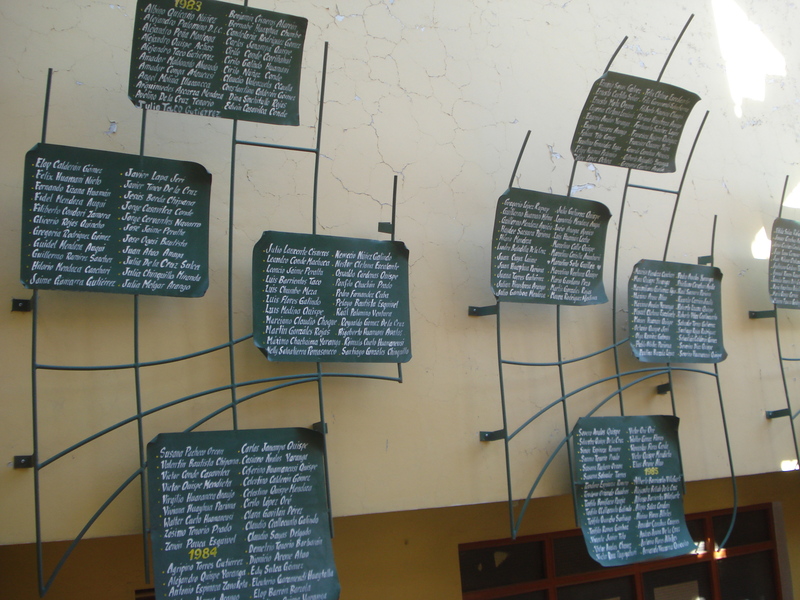 As you walk in, there are metal plaques listing the names of those who disappeared during the years of violence. The museum itself is just three rooms and a walk-through took 15 minutes. Yet I found myself staying for an hour and half, needing to take frequent breaks to process. First, you encounter a hallway lined with pictures of members of ANFASEP who still wait for information about the lost members of their families. On the other wall are national, regional, and ANFASEP-specific timelines for 1980 to 2005. “The women were caught between two fires.” And they suffered for it. There is also an exhibit on the different affected groups during the years of violence: young men, women, speakers of Quechua, and many more. Another room featured a torture chamber and an excavation site containing a lone, mangled skeleton, which had been moved into the museum. The final room was the toughest. There were several works of art, reflecting on the violence. Many contained panels of gruesome dioramas, each a different stages of the twenty years. Lining the walls and display cases in the room, were pictures of the disappeared alongside some marker of their identity. In some cases this was a piece of clothing, in others it was a journal, in one case it was the rope with which a young boys hands had been bound when he was found, dead. 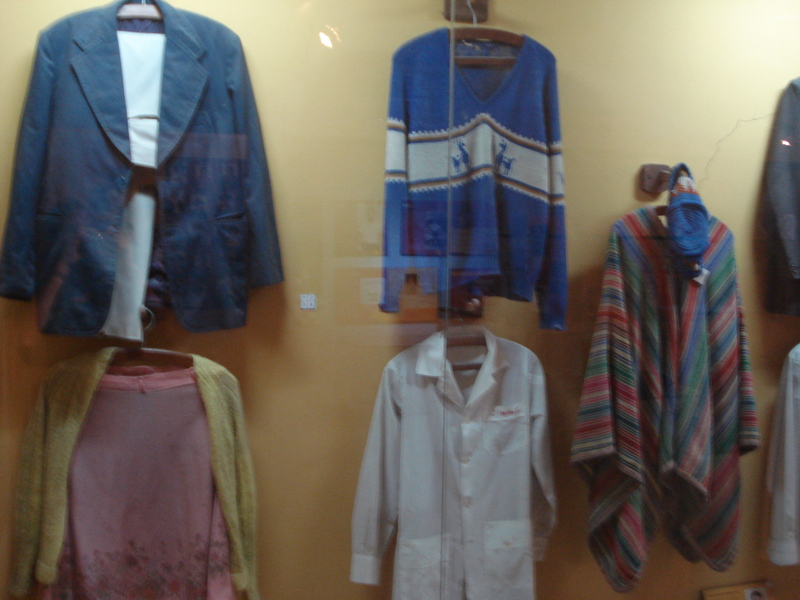 Each garment is connected to one of the disappeared in one way or another. Yet amidst these memorials to the loss and chaos, I found myself reflecting on ANFASEP. Their timeline is truly impressive. The group, largely founded by female relatives of the disappeared, took major action after their founding. They marched on Lima demanding answers, they fed those in refugee camps, they led searches for answers, and a founding member was given a Nobel Peace Prize in 1989. ANFASEP did not stand aside and allow the tragedy to continue unopposed. Whenever I hear about 1980-2000 in Peru, I hear about the violence. I hear about the terrorism, the equally terrible authoritarian response, and the sense of confusion. There are still so many lingering questions of the Commission for Truth and Reconciliation, adding to the message of hopelessness from these years. The main (and most important) message offered is: Never let this happen again. Yet ANFASEP shows another part of the story that is equally important to remember. That of hope and grace. ANFASEP saw the confusion and tragedy, and decided to take action, even as it was clear that they could not end the conflict. Theirs was not a message of sitting idly by, but one of action. It is so critical that this message is shared alongside the louder message of “Never again.” Turmoil and chaos can and do rage around the world, yet there are still groups who act for hope and grace amidst it all. Their actions may not end the chaos, but they are gestures of true humane action and reminders of the peace we seek. While at the museum, I met Clint, a doctorate student from UCLA, who is finishing up fieldwork on Transitional Justice. Not only had he heard of CEDAP, but he plans to visit because they served a critical role during the years of violence, creating one of the first comprehensive lists of the disappeared. I left that conversation reinvigorated for my work. Not only had I been a witness to ANFASEP’s message of hope, I learned a bit more about CEDAP’s role in promoting peace. 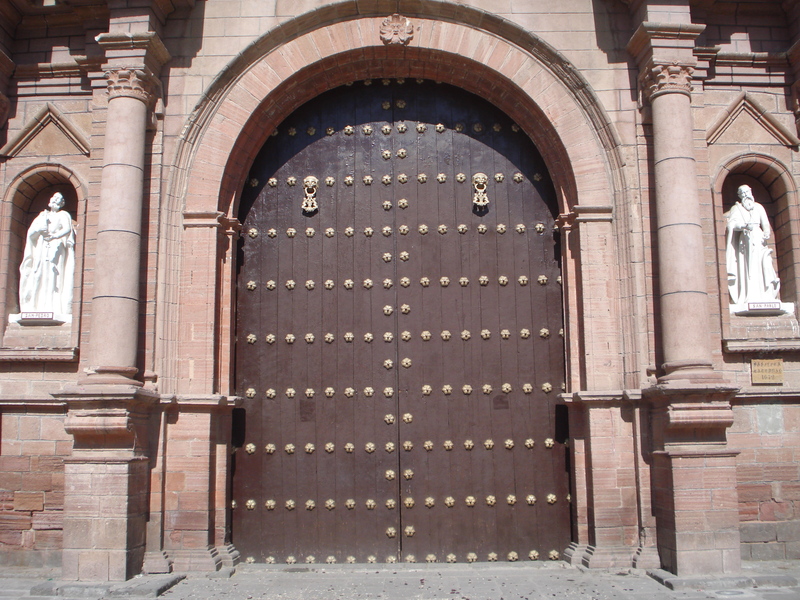 CEDAP carried its own message of hope, instead of fleeing Ayacucho when the violence started shortly after its founding in 1978. Even when one of their project teams was captured and tortured during 1988. As I start my second week at the office, I’m reinvigorated to work with CEDAP. Things may not be moving as quickly as I’d hoped, but I’m excited for all I will learn through my accompaniment. They worked for and made changes, during a time when it’s considered impossible to improve society. And that left me invigorated instead of drained by el Museo de la memoría. Thanks for the suggestions. Things have progressed better. I happened to be missing some of the picture in my early frustrations, mainly that she was on a very tight deadline and I came at a very unfortunate time. We’ve spoken since and I managed to be a little more direct about wanting to help around the office. She said there wasn’t much, but she offered me a few things to do. Likewise, she indicated that next week I’ll head out to see their projects next week. She’s been more hands on as time goes on, which has made me a little happier. Plus, I just needed to relax some. It’s only my second week. As Jenny put it, the most important thing is that I interact with office workers and build relationships while they are in the budget-planning phase of the year. So overall, things are improving and I’m learning that patience is essential to this type of accompaniment work. That and acknowledging that sometimes it’s a little more boring than riveting, or at the very least doesn’t seem to have much direction. Thank you for the offer to help. At the moment, I’m feeling optimistic about the rest of time here, but I’ll keep that in mind moving forward. things will work out well…..like you said it is only your second week.